Description: Construction of a new 24,923 sf, 2-story fire station, which replaces a smaller, 50-year old facility. The new station includes four drive-thru engine/apparatus bays, twelve dorm-style bedrooms with shared bathrooms, a large day room, fitness center, and a training room. The station also houses the City’s Fire Administration staff offices. The building is part of Greeley’s new City Center project in the heart of downtown Greeley and features three-dimensional brick artwork commissioned from a Colorado artist, specifically for the project. Description:The project is broken up into three phases. Phase 1/Pre-Construction includes: Design meetings, estimating/cost control, evaluation of design for construct ability, document review, value engineering, schedule development, identification of schedule conflicts, field investigations, pre-qualification of subcontractors and pre-planning for site activities. Phase 2: Bid the project out, collect pricing from subcontractors and establish the GMP. Phase 3: Construction of a new 7,700 SF fire station with two apparatus bays, office and residential living quarters. Description:13,129 SF main-level fire station and 1,771 SF basement. The facility can serve 32 firefighters and a district chief. The 75-foot tower, nearly twice as high as a traditional firehouse tower, is used for rappelling exercises and other firefighter training. Energy-saving, durable, long lasting, maintenance-free green materials were used throughout the facility. The station includes three bays, a public zone, a meeting room, and a private zone surrounding an interior courtyard. Description: A new 33,200 SF 2-story fire station with partial basement. The building includes a day room, kitchen and sleeping quarters, offices and a community room, a fitness center and room for a future emergency operations center. Also includes 7 vehicle bays and associated work and storage spaces. Description: New 10,655 SF 2-story fire station on a 0.83 acre site. Project includes the demolition of the existing fire station. The station is constructed with structural steel and structural CMU. Exterior finishes include stucco and smooth and split-faced CMU. Description: The Golden Fire Station No. 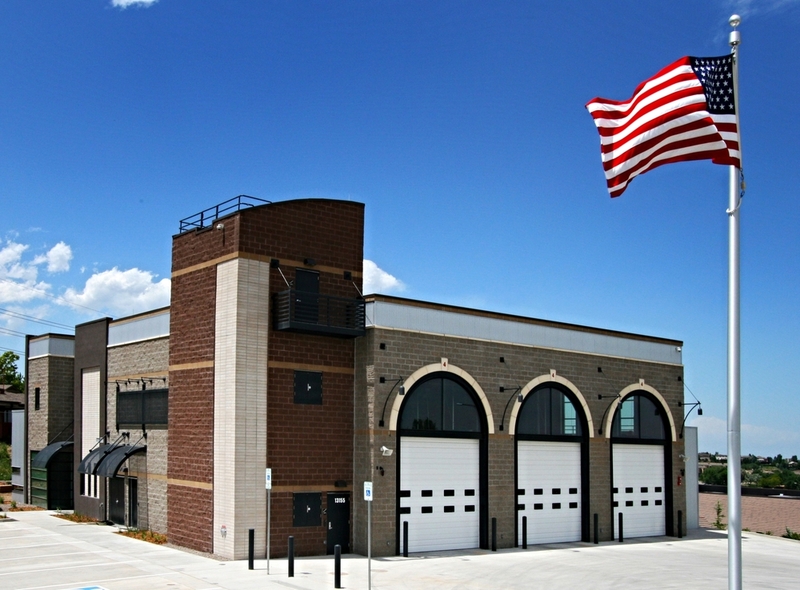 1 is a two-story 14,660 SF facility which contains a six-bay apparatus garage, watch office and ancillary functions on the main level. The second level contains administrative offices, a training facility and 4-bedroom quarters area. The station replaced the existing facility which was constructed in 1961. This was an urban site which was limited by many existing constraints for new development. Description: New construction of 1,600 SF burn building used for training. Construction also included site development of the surrounding areas. ARCHITECT: Colorado Civil Group, Inc. Description:This 10 acres site involves roadway reconstruction, concrete and asphalt paving, over lot, and fine grading, water line installation, dry utility relocation, landscaping, irrigation and a 4,500 SF burn building. Work will include: two-story structural concrete and CMU burn building, thermal linings, metal stairs and landings; erosion and sediment control; clearing and grubbing; overlot and fine grading; traffic control measures on North 35th Avenue incidental to waterline construction; earthwork, excavation and embankment with excavated “onsite” and fill material; concrete and asphalt paving; landscaping and irrigation; seeding in disturbed areas; irrigation control and supply to landscaping features; construction surveying and construction traffic control. Project is on an occupied site.. Description:Selective renovation of approximately 13,300 SF, structural repairs to approximately 2,600 SF, and site improvements. Renovation to corridors, offices, classrooms, restrooms and drill hall. Limited wall removal/construction, installation of fire suppression and direct digital controls (DDC) systems, HVAC and plumbing upgrades, code compliance upgrades, ceiling, lighting, and finishes replacement. Structural work anticipated: Interior floor slab, wall repairs/replace. Exterior work includes potential water line replace, expansion of military parking area (paving/security fencing). DMVA will separately contract geotechnical analysis, asbestos assessment and selective asbestos abatement coordinated with design scope.